Imagine your customers connecting to your agent’s mobile directly through extension without the caller knowing their number. Also, storing their call details and call recording directly to the Cloud. Hassle-free EPABX system is designed to help connect to agents through extensions directly linked to their mobile numbers. This cloud- based app is easily accessible from any part of the globe additionally, thus is extensible. 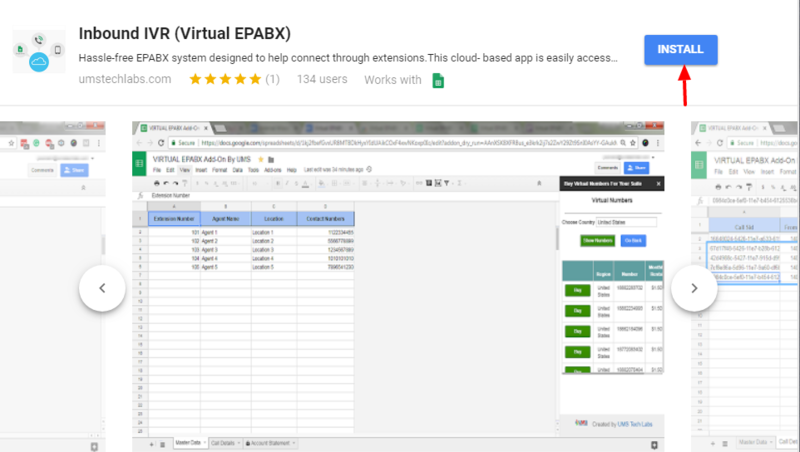 Virtual EPABX can be downloaded from Google Marketplace. 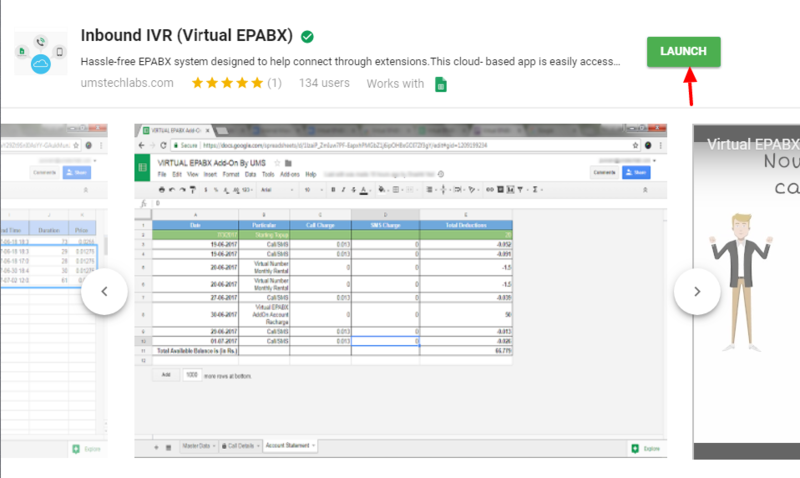 Alternatively, you can go to “Google Marketplace” and search for “Virtual EPABX” in the search bar. In case you are asked for any kind of permissions and you see a screen as the one below, click on “Continue” to grant the necessary permissions to install the app. After clicking on “Continue”, you will be asked to sign in to your GMail account, in case you are not already signed in. If you are already signed in, you will be asked to choose your GMail account. While launching the app for the first time, you can launch it from the “Google Marketplace” itself by clicking on “Launch”. 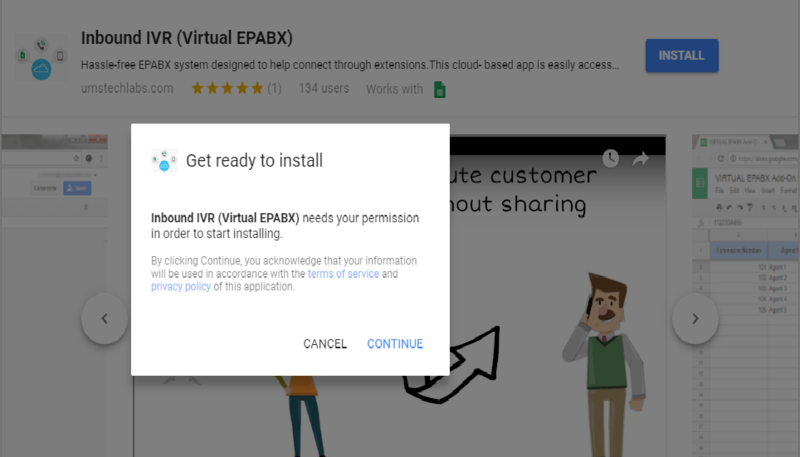 Alternatively, you can launch the “Virtual EPABX” app by going to GMail, clicking on the apps section and then clicking on the Virtual EPABX app’s icon(provided that you are signed in to your account). 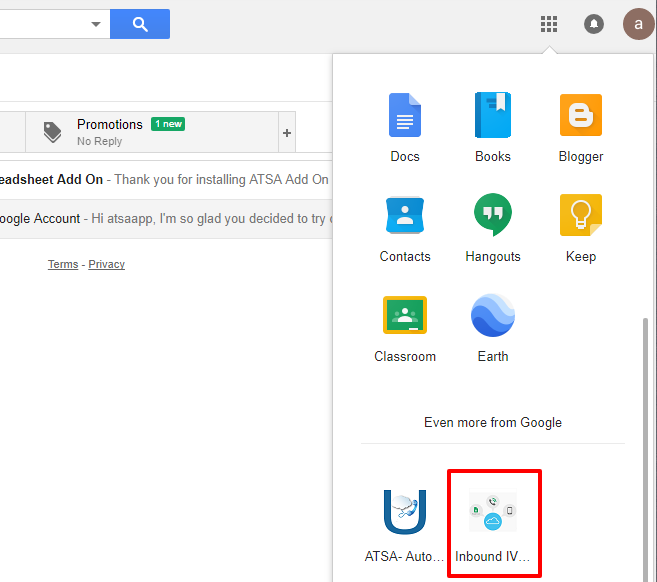 Launching the App will open a Google Spreadsheet which has been shared with you. 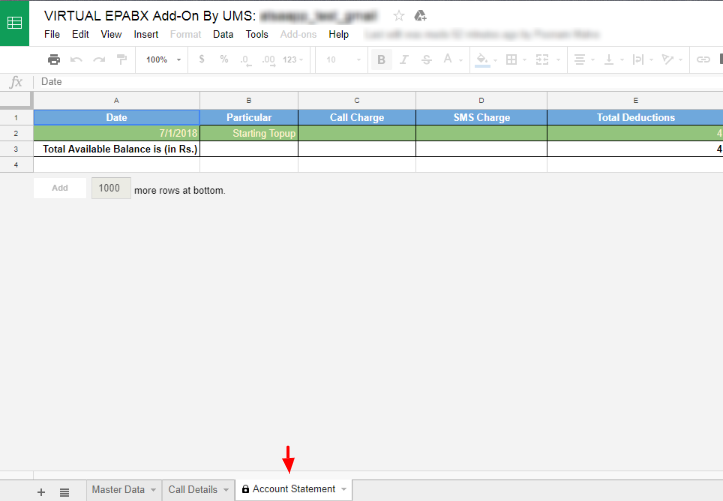 This spreadsheet serves as the app dashboard and contains three worksheets, the Master Data sheet, the Call Details sheet and the Account Statement sheet. Master Data sheet, where you have to enter the extensions and their mapped agent names, location and the actual contact numbers of the agents(along with their respective country code). Call Details sheet, where all the details of the calls will be recorded. Account Statement sheet, where the details about a customer’s balance and the deductions per day are maintained. 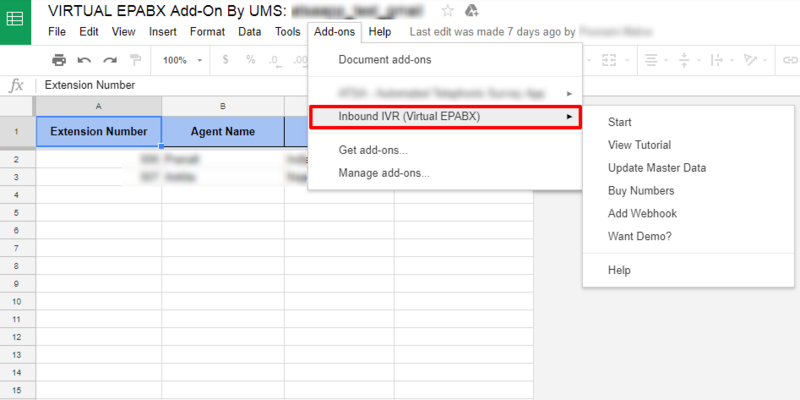 To go to the Virtual EPABX menu, click on the Add-ons menu, and then click on “Inbound IVR(Virtual EPABX)”. Purchasing a dedicated virtual number. The panel shows your account balance. You get a promotional balance of $4 initially alternatively you can recharge as per your consumption. 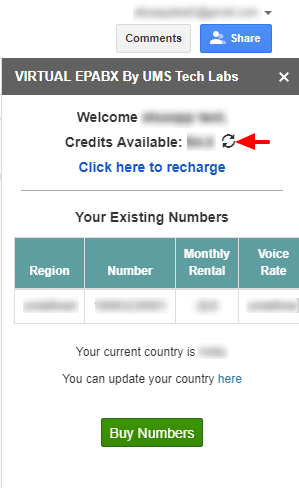 The panel also contains a table showing your existing virtual numbers(the one that you have purchased) with its details.If you are yet to purchase a dedicated virtual number, the table has “undefined” values/ the table is empty. To proceed further, you need to buy a virtual number. To buy a virtual number click on the “Buy Numbers” or alternatively you can use using the “Buy Numbers” sub-menu option in the “Add on” menu. To know more how to buy a dedicated virtual number click here. Time zone determines the format and the timezone to display the value of the Date and time columns in Call Details spreadsheet. In case you do not explicitly set the time zone , it is set to ISD format. If you update your timezone, you have to click on “Submit”, to update the timezone. You can update your timezone as and when required by clicking on the link provided in this screen. After you have a virtual number and you have ensured that you have sufficient balance. Users will call the virtual number and press the desired extensions to connect to agents. 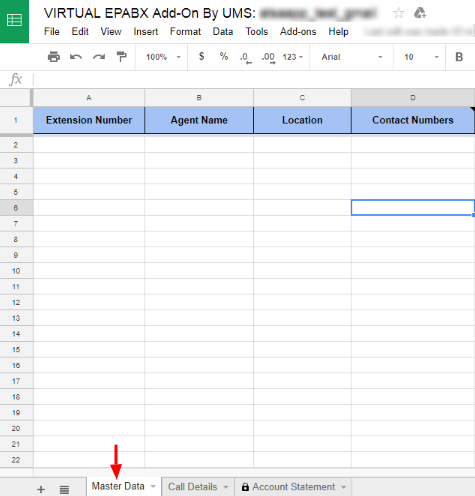 The extension number entered must match one of the extensions that you have specified in the “Master Data” sheet. 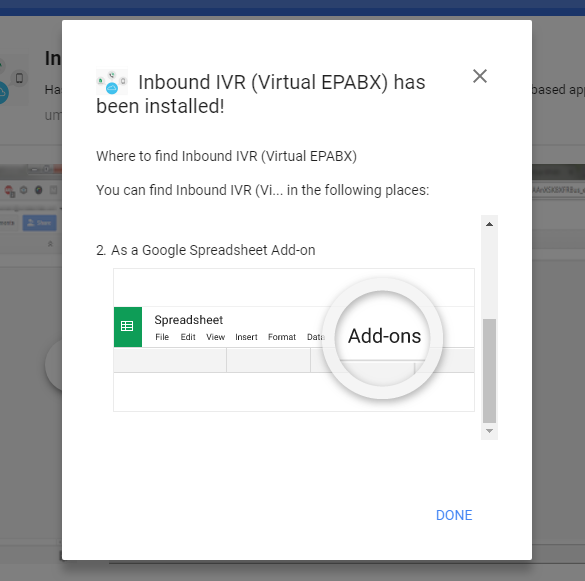 If you need any help understanding the app you can also check the tutorial provided by clicking on “View Tutorial” in the Inbound IVR(Virtual EPABX) menu. After you click on “View Tutorial”, you will see a step by step tutorial on how to use the Inbound IVR(Virtual EPABX) App. 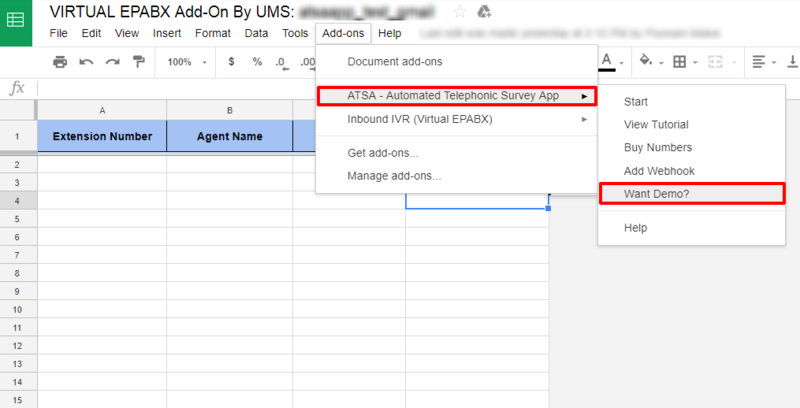 Every time you enter, update or delete details in the “Master Data” sheet, you always need to go to Add ons → Inbound IVR (Virtual EPABX) → Update Master Data, after you make the changes. On clicking on “Update Master Data”, you will get a “Data Updated Successfully” message. After you get the Data Updated Successfully” message, your system is now set for use. Your customers can now call you on your virtual number and click the desired extensions and their calls will be diverted accordingly to the agent corresponding to that extension. All the details about every call will be maintained in the “Call Log” sheet. All the calls made to the virtual number are recorded and the recording URLs are stored in the “Call log” sheet. These recordings can be used as and when desired. All the details about the deductions and account balance will be maintained in the “Account Statement” sheet. 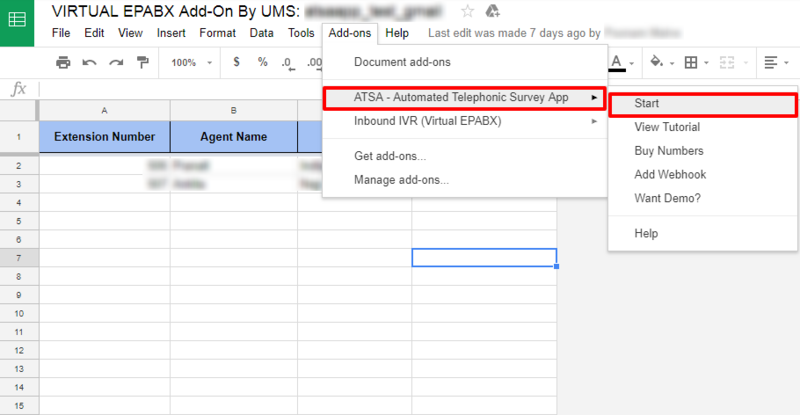 To buy numbers, go to Add-ons → Inbound Call (Virtual EPABX) → Buy Numbers. You will see a screen where you have to select your country and click on “Show numbers”. 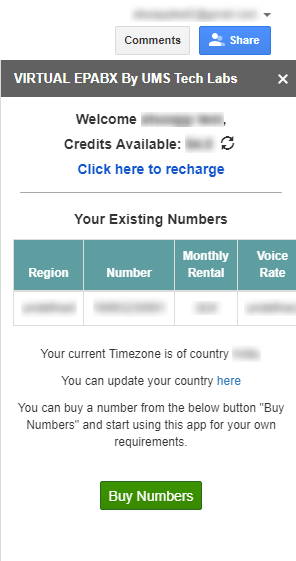 When you click on “Show numbers”, you will see a list of all the numbers available in the selected country along with their rental plans. The screen below shows this process. You can select number that you wish to buy and then click on the “Buy” button in front of that particular number. Note: that if you already have a virtual number and you buy a new one, the new number will replace the old number. 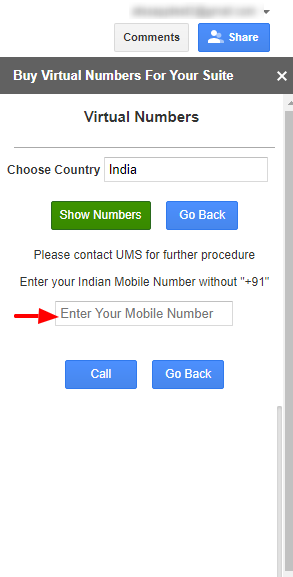 If you are an Indian customer, you will have to contact us for the numbers, when you select country and click on “Show Numbers”, you will see a text box where you will have to enter your number and click on “Call”, you will then get a call from us for further procedure. The process of buying a virtual number from the “Start” menu or from “Buy Numbers” menu are the same. Adding a Webhook can let you alter the behavior of the App after the survey is done, with custom callback. You can do things like “Send an SMS” or “Trigger another Outbound Call” or “Auto-connect to your Agent/ Sales Rep” etc using this feature. Feel free to contact UMS in case you need more help with this. 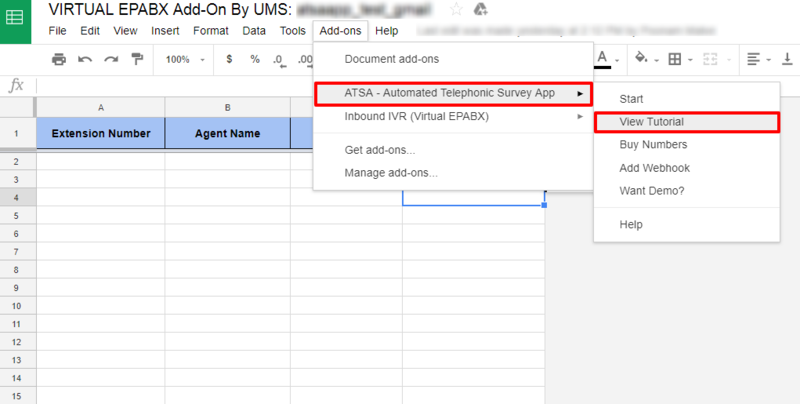 Incase you want to access the data in a 3rd party web service of CRM/ App, you can add a webhook by going to the “Add-ons” tab, select “Inbound IVR(Virtual EPABX)” and then select “Add Webhook”. 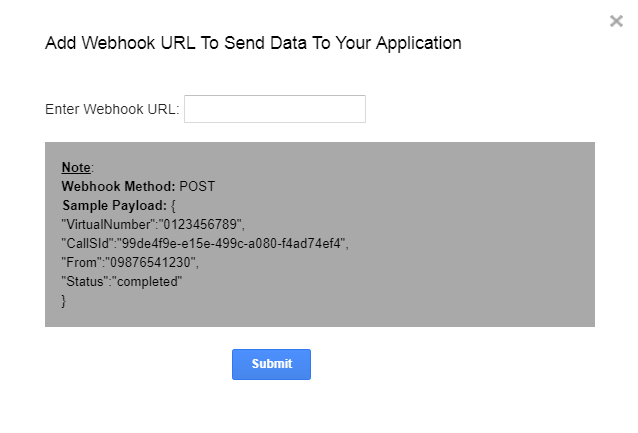 When you click on “Add Webhook”, a screen as the one below will appear. Enter the URL of your web service and click on “Submit”. It is mandatory to use the POST method. After a call ends, the details of the call will be sent to the specified URL. In case you want a demo from us, you can ask for a demo by clicking on “Want demo” in the Inbound IVR(Virtual EPABX) menu. 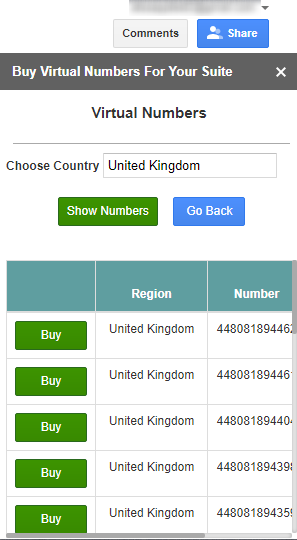 After clicking on “Want Demo”, you will see a screen as the one below, where you have to select your country, enter your mobile numbers and click on “Call”. You will soon get a call from us. When you click on this link, you will be redirected to a page where you will see a screen as the one below. 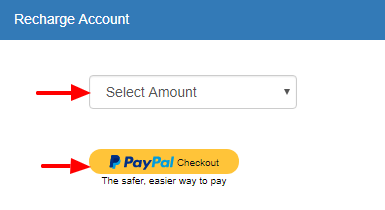 In that screen, you will be asked to enter the amount you want to recharge your account with and then click on the “PayPal Checkout button” both are highlighted in the screen with a red arrow. Once the payment is done, the amount is debited to your account. You can see this by clicking on refresh next to the credits on the side panel. Refer the screen below. 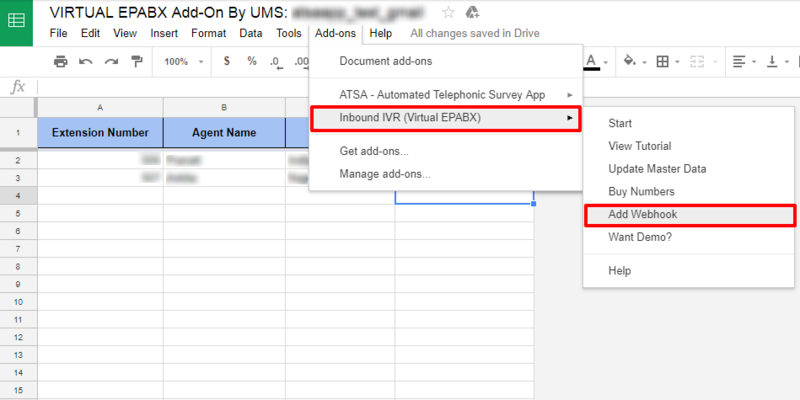 In case of any queries related to Inbound Call (Virtual EPABX), just write an email to us on customer-success@umstechlabs.com and we shall get back to you soon.